To save yourself time when hiring, it’s a great idea to have an Employment Application Template (also known as job application template). This document will give job seekers a few details about your business while you’ll get the information you need about them, their job history, and their salary requirements. Get started Start Your Employment Application Answer a few questions. We'll take care of the rest. Since you’ll have several applicants vying for the same job, your company might choose to create an Employment Application Template. You should fill out the “Employer Information” section as you see fit and have the applicant fill out the remaining sections. It’s recommended you make some copies of your Employment Application Template, so that as your business grows, you always have one at the ready. Employment Application Template. To create your own, click on the image above. There isn’t too much information in the Employment Application Template about your business. That's because the idea is for the applicant to provide information to you, not the other way around. Job seekers can fill out their name and address, position applied for, emergency contacts, salary desired, and more. 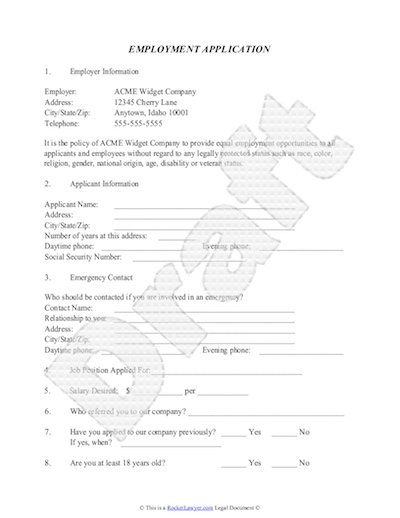 Getting started on creating an Employment Application Template is easy. Simply click below. You can have your applicants fill the rest out online or by hand when they stop in for an interview.